Picture this: Snow is falling and the temperature is below freezing. You are at work, or the mall, or over the river and through the woods. Anyway you are far from home as you climb into your car with the hope that it starts right up and gets you going without a hitch. Much here depends upon your battery, a square little black box that gets forgotten until it really needs to perform. You all know that familiar, heart in the throat scene – the crossing of fingers, the quick benediction – until we hear the roar of victory or the click-click-click of defeat. Batteries are the most important item to check when heading into the colder weather. At least once, and maybe twice for good luck, have the battery checked during the fall as part of your oil change or general maintenance work. Many shops will check batteries as a courtesy and modern testers produce results in very little time. It’s important, because a battery that worked fine all summer may be one or two cold days away from conking out. So Now It’s Dead, What Kind of Car Battery Do I Need? Manufacturers rate batteries for cold cranking amps. The higher the cold cranking amps the better the battery will perform in the cold weather. Like us, a car is harder to get going in the cold weather so more power must be drawn from the battery to turn over the engine. Batteries come in all shapes and sizes so its best practice to install the battery that is appropriate for your car. The battery should be the right size for the compartment, and be firmly secured in its place. A battery that moves around will fail much faster than a secure battery. Brands are important here too. 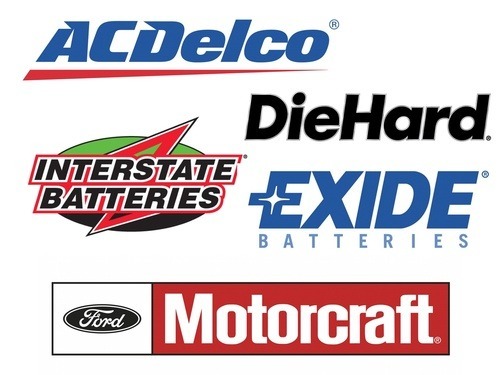 AC Delco, Interstate and Motorcraft are batteries that many technicians consider top of the line and will last much of the length of the warranty. Diehard and Exide are good brands too. Remember that even with the most generous of warranties a battery that fails still leaves you on the side of the road, so dependability is the key. I’ve Picked One, Now Who can Install the Battery for Me? Most automotive service professionals can perform this service. While changing a battery, a good technician will clean off the clamps. This is to make sure there’s good contact between the battery terminals and the cables that deliver the punch to the starter. 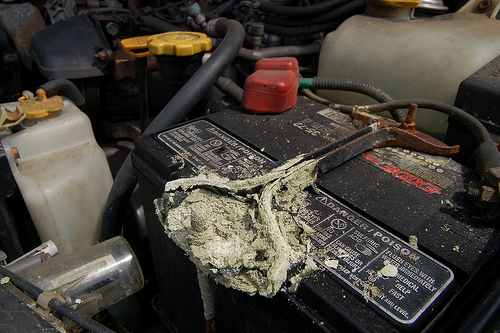 Even some corrosion can rob enough power to prevent the car from starting. Ask for a good protective spray to be the final touch of any surface. This protection will slow down the corrosion that will build up on the connections. A little extra work on the installation will really add up when it gets chilly. Ready to Find Someone to Install Your Battery? Article was originally written by an ASE Master Technician, since been updated. This entry was posted in Maintenance Tips, Repair Services, Seasonal and tagged auto repair, car battery, car maintenance, car repair, openbay, winter car, winter car preparation. Bookmark the permalink.